G.Skill has announced its lineup of DDR4 memory kits compatible with AMD’s new Ryzen Threadripper CPUs. The Flare X quad-channel kits are offered in 32 GB and 128 GB configurations and feature 2933 – 3600 MT/s data transfer rates. The company plans to make the new kits available in the coming weeks. As reported multiple times, AMD’s processors based on the Zen microarchitecture have a number of peculiarities with their memory controllers that prevent high-end memory modules designed for other platforms to run at their labeled data transfer rates. AMD is working with makers of motherboards to improve compatibility of Ryzen platforms with advanced DIMMs via BIOS updates, but in the meantime makers of DRAM modules release special versions of their products tested to be compatible with Ryzen. Since the Ryzen Threadripper CPUs are based on exact same dies as the regular Ryzen processors and have the same memory controllers, they have the same DRAM compatibility habits as their brethren with lower core counts. That said, in the coming days and weeks leading suppliers of DIMMs will be announcing kits compatible with the AMD X399 platform. 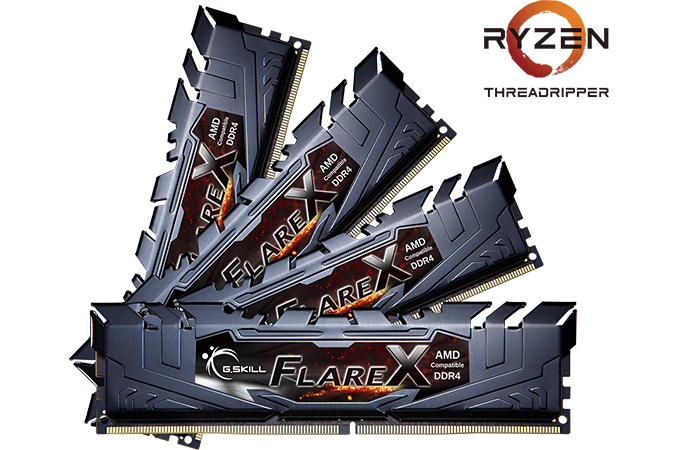 Being one of the most popular makers of advanced memory modules, G.Skill is among the first to formally introduce its Flare X kits designed for AMD Ryzen Threadripper CPUs. G.Skill’s family of X399-compatible DRAM consists of four quad-channel kits: three 32 GB (4´8 GB) kits available at 3200 MT/s, 3466 MT/s and 3600 MT/s data transfer rates as well as one 128 GB (8´16 GB) kit that can run at 2933 MT/s. As for voltages, all kits and modules require 1.35 V, which is standard for enthusiast-class memory. As usual, the higher clocked kits also come with higher latencies, with timings starting at CL14 for DDR4-2933/3200 modules and reaching CL16 by DDR4-3466/3600 speeds. All the modules are based on Samsung’s 8 Gb B-die ICs produced using the company’s 20 nm process technology. At present, G.Skill’s Flare X family of Threadripper-compatible DDR4 kits does not look like a broad one. For example, it lacks any 64 GB options (it should still be possible to use two identical 32 GB kits), modders are going to miss RGB lighting, whereas those planning to use Threadripper for work are going to miss ECC support on the high-capacity kit. It is logical to expect G.Skill to introduce more Ryzen Threadripper-compatible DRAM options over time, but for now owners of AMD’s new HEDT platform will have to choose something from the available options. G.Skill traditionally does not touch upon pricing of its memory modules because DRAM prices always fluctuate. 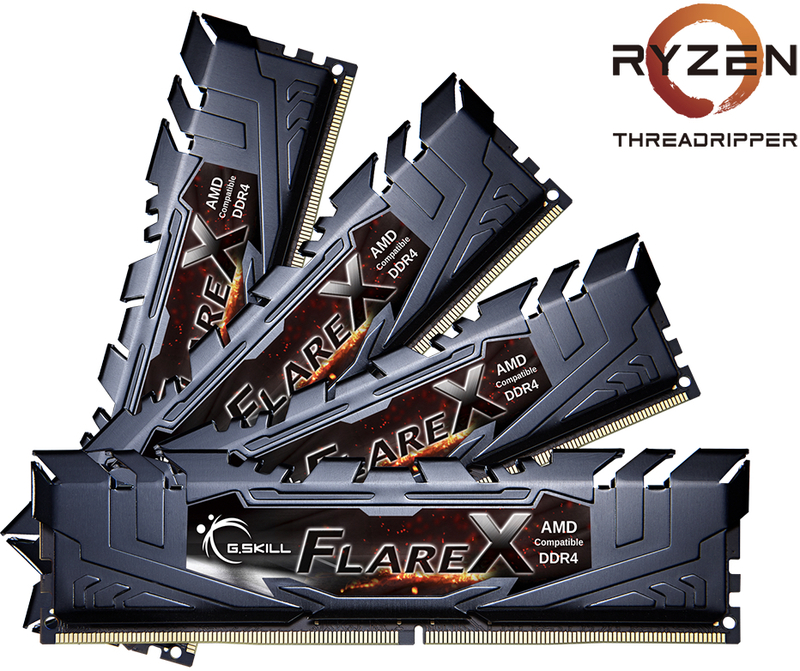 As for availability timeframes, expect G.Skill’s Flare X memory modules for AMD’s X399 ‘Threadripper’ platform to arrive in two or three weeks, in late August, or early September. Any information if and when there will be big Ryzen / Threadripper memory testing? I'll count the lack of RGB lighting, or lack of any lighting at all, as a plus.